The Sierra Madre Tattler! : Has There Been An Increase In Crime In Sierra Madre? Has There Been An Increase In Crime In Sierra Madre? Some people put a lot of faith in these "Safest Cities In California" surveys. 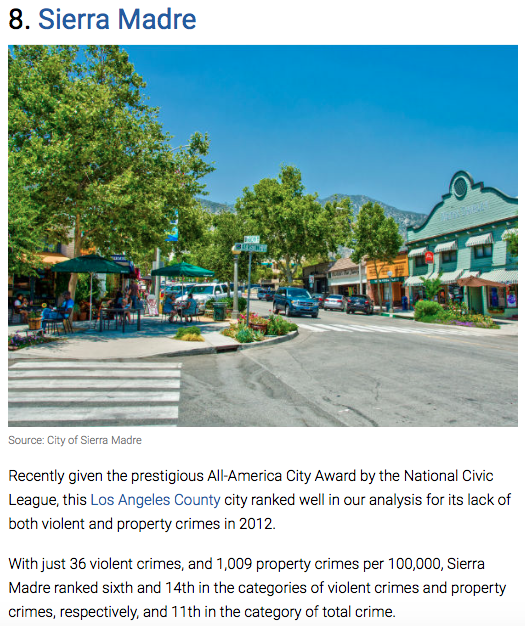 Especially in Sierra Madre, which usually ranks amongst the very safest in all of the Golden State. Treasure Henderson, who runs the Mountain Views News, obviously looks forward to these, and gives them some deeply meaningful exposure in her paper every year. This one being no exception. To bring you up to speed, here is 2018's article. Now don't get me wrong. 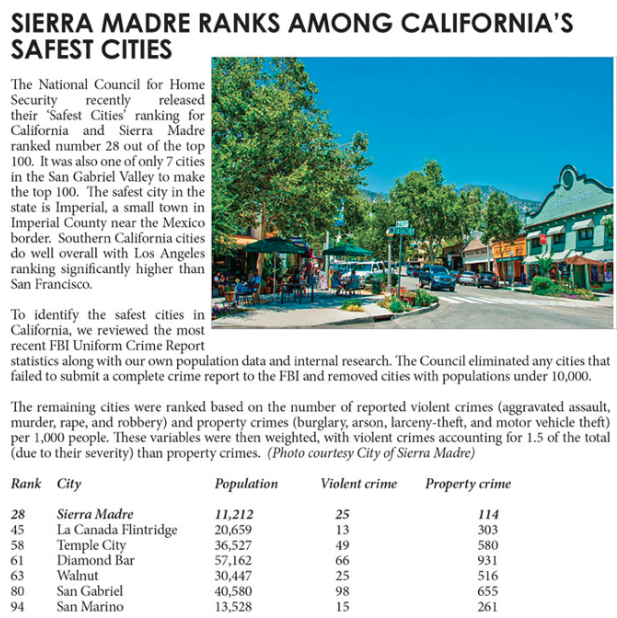 "28th Safest City in California" is not necessarily a bad thing. There are Mayors of many cities in this state who would happily sell the souls of their dear mothers for such a result. But is that number 28 really up to past Sierra Madre standards? Based on some similar reports from years gone by, perhaps not. The first result we dug up is from something called the Safewise Report. The year of this survey's release was 2017 (link). This next safe city survey was released in 2016, and it is the work of something called Background Checks.Org (link). Here Sierra Madre came in a very admirable #6. The final survey I found was released all the way back in 2013, with the crime figures for this report dating from 2012. 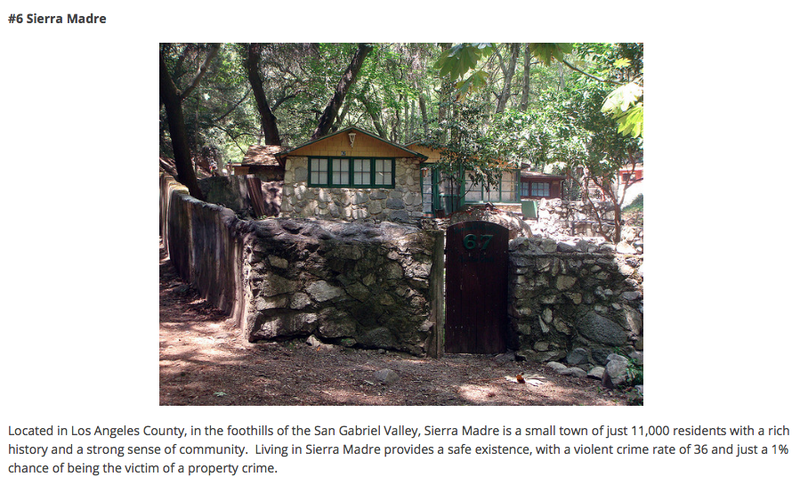 It is the work of something going by the name of Movoto (link), and here Sierra Madre ranked a remarkably safe #8. So there you have it. Like I said, this year's rank of "28th Safest in California" is not necessarily all that bad. But as we have now seen, things might have been a little bit better before. One would never know how many crimes are committed in Sierra Madre as the PD never seems to give any true info. The newspaper reports 3, maybe 4 crimes committed. Me for one is still waiting for the detectives dept. to mention solving even just one of the crimes that have been "under investigation by the detectives dept". It's been years... the To Do file must be really big. I believe Detective Amos is still investigating himself. He cannot talk about it. Is there any more news on the Matheson investigation? Detectives are just waiting to retire at 90% pay and then get a job at the race track. Everything used to be better before. Period. Correction: Life used to be like that. 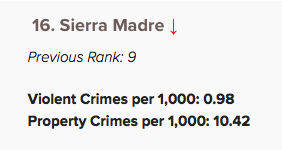 Maybe is Sierra Madre had brought in the Sheriffs we'd still be in the Top 10. Creepy how some always demand reverence. As if you don’t pander to then cops then when you need 911 there will be some kind of retribution. That is corruption. It could well be that the Sherrifs could have done a better job. Then again their upper ranks got caught in corruption too. You're right. It's a guilt trip built on fear. Lol, why would the Sheriff's need to work in a safe town? Are you searching for hand holding on Valentine's Day? When will Sierra Madre start issuing concealed weapon permits, then 2018 crime will fall to the floor. OK, but I'd stay out of the Buc if I were you. Couple lite beers and some of these guys'd be going OK Corral on you. Gunfight at the Hotel Shirley. keep your back in the corner and an eye on the door (an old cowboy trick). Things in the CRIME department seem to be going down hill slow. Wonder what the crime statistics show for that time when the sheriff was in town. Don't remember exactly but there were certain functions that was not in their contract or that the SMPD gave those instructions? Just wondering what the numbers were then during the night watch and what were the instructions. That's the direction you go when you have a week case? Just saying. 7:50 am usually the Sheriff's were asleep at the wheel, not much crime in the bedroom community. Catch and release. Thank you Jerry. With the effort you make to be consistently negative about anything and everything your insides must be rotting. The effects of a steady diet of unicorn sparkles are far worse. The idea is a local adjudicated newspaper should share real news and always tell the truth. We don't have one that does that. Good point. These surveys do claim to use FBI crime statistics. Maybe there is violence we never hear about. 4:39pm. Ya mean FISA Russian involvement? #6 photo above there is not in Sierra Madre Canyon is it? Looks like it could be in Big Santa Anita Canyon. Harumpf! Agreed, unless it’s an obscure angle of someone’s back yard. Recalled Sho Tay! Hey! Hey! Ho! Ho! Sho Tay got to go!